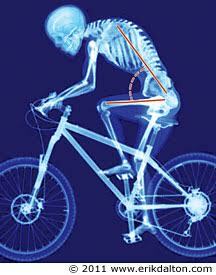 Cycling completely changes the weight distribution through your muscles and spine, and also bends the spine into an unnatural position. The neck in particular must compensate so that you can see where you are going. In a poor riding position this can be quite extreme; like standing and staring up into space for hours on end; it’s no wonder neck muscles can get tired and irritated. If you are experiencing a few niggles and aches on long rides, chances are they can easily be resolved with positional adjustments, long before they become a runaway problem. Thankfully the human body is extremely versatile and with consideration for position, through correct bike sizing and set-up, cycling should be a comfortable experience. It’s fairly clear that riding position directly affects the alignment of your neck and spine, in particular, your handlebar position and set-up is crucial. Making changes to your handlebar position to prevent or correct problems can be simple as alterations in this area are easily achieved. By taking your bike in for an assessment, changes can be made to the bike quickly and relatively cheaply with an almost immediate effect. A primary concern is excessive reach to the bars, causing the neck to be permanently ‘craned’ or hyper-extended. This can be a combination of not just how far the handlebars are from the saddle, but also how low down they are. Changes can be achieved by increasing the handle bar height by placing spacers beneath the stem to lift it up or by or altering the stem angle to give you more or less rise to achieve the optimum position. Lever position is also important, even with your handlebars in the right position there is still the question of where to position the levers. Positioning the brake levers slightly higher will encourage a more upright riding position, as you will spend a considerable amount of time riding with your hands here. To learn more, including exercises you can do to further prevent neck discomfort whilst riding from a Chiropractic viewpoint, follow the link on our Facebook site to the original article this column is based on.